Providing educators with hands-on interactive learning materials for use in their classrooms through donated and re-purposed items. The resource center has a wide variety of unique and useful materials that Tucson teachers might find useful for the classroom projects. Whether it’s plastic bottle caps and fabric scraps or golf balls and office supplies, Treasures 4 Teachers has many items to make teaching easier, more rewarding, and much more cost-effective! Learn more at http://t4teachers.org . They are located at 6800 N. Camino Martin #124 in Tucson. 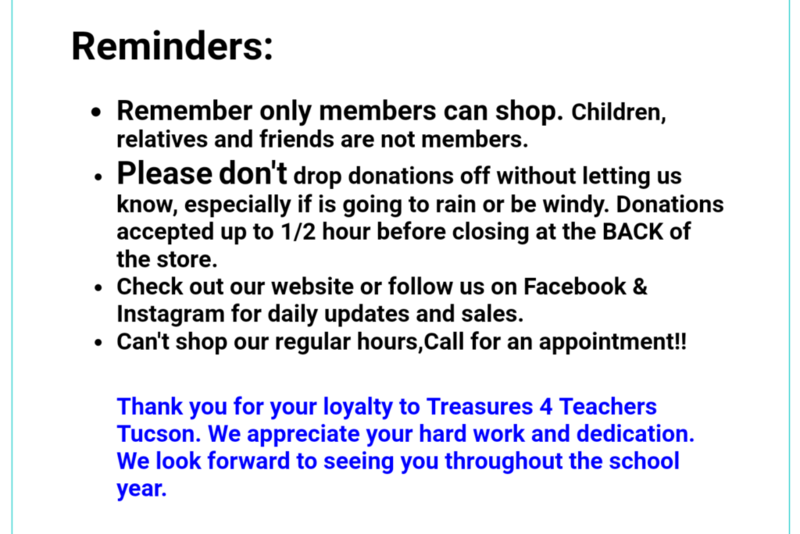 Follow Treasures for Teachers in Tucson on Facebook !